In this card a man stares out to sea as he stands behind the security of a low wall. In his right hand he holds a globe and in his left a Wand which he places firmly upon the wall. A second Wand stands behind him and is bolted to the wall. The man has his back to this Wand and appears to be more interested in staring pensively off into the distance. He seems to be in a world of his own and totally unaware of the fact that we are looking at him. He may be physically present as he stands surveying his domain and all that he has achieved but in his mind he may be thousands of miles away. By his style of clothing and lavish surroundings, the man appears to be well off and quite comfortable. The fact that this man stands above the village below we must assume that he is in a position of power over his surroundings. He certainly does not appear to lacking in anything or under threat of any sort. The Wand held firmly in his left hand is raised into a more superior position to that of the Wand bolted to the wall. This is the original Ace of Wands, the Wand that has reignited his passion. He holds on tightly to this Wand. He may have waited a long time for that original Wand to land in his hand and awake his senses, so he will be reluctant to let it go or put it down. If he was totally free, he would have run with this Wand as soon as he was given it in The Ace. He would have let it inspire, motivate and carry him forth him into action. He believes that this Wand can take him to exciting places and even greater achievement than he already has. As he stands now, he is Ruler of his Kingdom, but that may not be enough. The Second Wand which is bolted to the wall symbolises that he has commitments at home, with business, projects, relationship or family. He can not just ignore them and focus his attention on that which is new and novel. Or can he? The number Two is Numerology often deals with opposites, extremes, polarity and the dilemma as in which way to go, to stay or to go, up and down, happy and sad. It also deals with conflict of opinions and opposition. What The Ace of Wands brought him was a singular gift; an awakening and igniting of his passions and interest. Not everyone else may be as enthusiastic about the potential of The Ace of Wands. It is in The Two, the man realises he he must make a decision, and that he may be alone in his feelings, enthusiasm and desire. Does he please himself or does he please others? Compromise is always going to be difficult in the Twos when there is a natural inclination to want to get your own way. There is very little middle ground in The Two. The low wall serves as a divider between the world he occupies physically and the outside world he has been drawn to. The wall is the security and power he has built up in his life. Because he is a Wand, this man has not built his wall too high for that would block his view of the outside world which he loves and also because it would only serve to make him feel claustrophobic and hemmed in. Wands like to move and have a dread of being restricted in any way. The man has left his wall low enough so that he can keep an eye on what is going on in the rest of the world and also that he can easily step over it should he decide to change location or make a quick escape. Note the brown colouring of his over garment. This symbolises the earth energies (commitments and obligations) that bind him to his current situation. However his orange under garment, boots and red hat represent his fire energies which make him restless. The need for excitement, adventure and movement burn deep within and consume his thoughts. The cloak is part of what holds him but this can easily be cast off when he eventually decides to make a move. He is tied or bound to his world by something or some person. In his natural and instinctual self, this Wands man would just up and go wherever he fancies but the Wand bolted to the wall has some form of influence or control over his movements. This man has a decision to make. The decision may not be his to make entirely. Others may need to be consulted or taken into consideration. In his right hand he holds a globe which represents both his personal world and the world that lies far beyond his view. The fact that he holds this globe firmly suggests that he has conquered his world and in power over it. However, the world he occupies appears to have become so small that it can fit it into the palm of his hand. He stares at his globe/world trying to find something of excitement and meaning in it. The Wand in his hand is mobile so he can take it wherever he wishes, which is so symbolic of The Ace, while the other must stay behind. On the other hand, the man may be very happy in his own world but is forced to consider leaving it due to matters outside his own control. Recession and high unemployment may leave him with no option but to go. He must make a decision as to whether he is prepared to settle for little or take the risk of leaving all he knows and loves in search of better career or financial prospects . This man appears to have everything and is probably much envied for his prestige and position. He now wants more and something tells me that he does not believe that what he wants will be found at home. The walls of the castle that offered him security for so long now appear to be hemming him in. He has outgrown his present circumstances and now wants something different. Nothing is terribly wrong but there is a strong sense of boredom here. He is making a decision as to whether he should stay in his safe comfortable but predictable place or to go. The excitement and new experiences he seeks with The Ace may be found on foreign soil as we see him stare out across the water. Indeed he may be thinking about travelling far away from home, and possibly all he knows. If he could just kick the Two of Wands out of the way he would be free to move on to The Three of Wands with his original Ace. Patience is a virtue not often found in the Wands so when the Two of Wands appears, frustration and a sense of entrapment can often be found. The Ace of Wands is burning a hole in his hand and his feet are itching to move but there he stands motionless, at present unable to move or do anything. He needs to think now and make a proper decision, not a hasty one, but one where he takes the time to deliberate over the pros and cons of what he wants to do. If not he may discover in The Three of Wands that the decisions made in the Two and any subsequent actions taken in The Three fail to turn out as he had expected. He may regret making impulsive decisions in The Three. He may be terribly disappointed with the results. The Two of Wands often represents being at a crossroads in your life and not knowing which direction to take. Wands do not like to stand still for long so this is bound to cause them frustration. 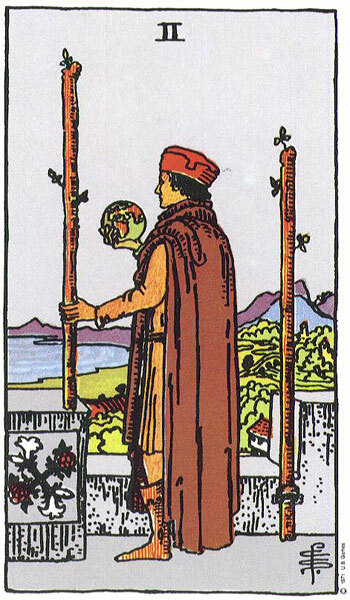 The other aspect of The Two of Wands brings us the dilemma of decision once more. This time the man now may have to consider staying as he is, the sole ruler of his domain, or to join forces with another. This would represent one strong power partnering up with another. He may be weighing up the pros and cons of expanding his empire and giving a share of power to another. This partnership may indeed take him to new lands and even greater heights, but it will also bring restrictions. However, the man may simply be deciding to expand into the overseas market. The bolted Wand is secure and steady so does not necessarily have to be worried about. He may decide to travel and or do some research into the matter before making his decision. Because the man appears to be standing still we know that his decision will not just come out of the blue. It may appear that way to others when it does, but make no mistake, he has been dwelling on his situation for some time. It may take others by surprise but when The Two of Wands appears, depending on surrounding Cards, the person represented by the Figure may have moved on some time ago and is now just waiting for his physical self to catch up. The Two of Wands often brings the decision of whether to stay with what you are used to or to go in search of new experiences or a new life. It can suggest that you are bored with your current life and want more. On the outside it may appear you have it all and are very successful but changes have been occurring on the inside for some time. You may have a new plan of action or a burning desire to do something else. You may feel that your fires have been burning low and that you are in dire need of a new lease of life, change of scenery or change of faces. The Ace of Wands has fallen firmly into your hands and now you want to do something with it. You may have been given a wonderful opportunity to travel, a door may have opened for you career-wise or you may want to start something completely new. You may struggle with the decision The Ace demands of you in the Two of Wands. The Ace wants immediate action and movement while The Two is in Two Minds about it all.The second Wand in the Two of Wands suggests there is more than just you to take into consideration. The decision you need to make may effect others. It may entail leaving someone or something behind as the less baggage you have, the lighter you travel. This card is notorious for highlighting sudden unexpected actions or departures. This can often cause turmoil and upset to those around you but if they had been paying attention they would have seen you were not happy with your present circumstances. In a relationship reading The Two of Wands can suggest there is trouble. One partner may have become remote and detached withdrawing love or even walking out suddenly on a long relationship causing shock all round. It may be a case of choosing between two possible partners. One may be rock steady, secure and reliable while the other may be exciting, adventurous and inspiring. As a couple you might be in the process of making the painful decision to emigrate and leave all you know behind including family and friends. The decision in the end may be sudden and departure swift should a golden opportunity be offered. The departure may also be the knee-jerk decision to just up and go leaving job, selling up house and just getting the hell out. On the other hand if you have met someone from overseas you may be faced with the decision of maintaining a long distant relationship or whether to pack up and move over to them. In a career reading the Two of Wands represents deciding to stay in the position or career one is in or to move on to something completely different. Suddenly leaving a boring job after a long time, just jacking it in and taking off. It may have been a very secure position but it offers little in new challenges or interest. You may have a desire to expand your horizons and are considering travelling overseas in search of work. Your are bound to be spending considerable time doing research on the internet to see what is out there and where you might fancy going to. You may have wonderful qualifications and experience but with recession and high unemployment, you may be forced to leave home and go overseas to find work. If in business it may be a time to decide whether or not to expand into the international market. The Two of Wands stands for a powerful position, and in business it is a card for success with a desire for even more success. A business cannot just stand still like the Wand bolted to the wall, it must be constantly up-dating and expanding. This may involve the decision to join two big businesses or the forming of a Partnership that will yield greater results and profit. When the Two of Wands appears reversed in a reading it may highlight that you badly want to move on from a unfulfilling situation but do not have the guts to do it. Fear prevents movement which eventually causes paralysis and stagnation. Someone or something may have quite a control over you leaving little room for free thinking. You may feel held back by a person and carry deep resentment. 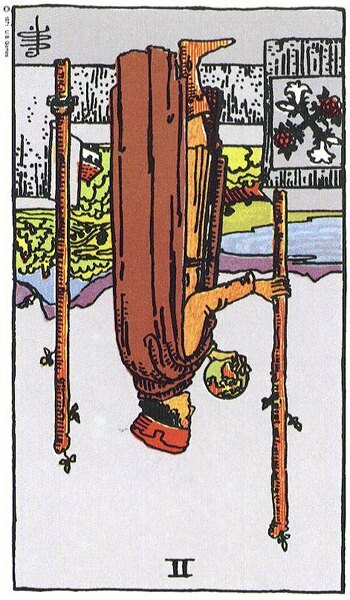 While The Upright Two of Wands can suggest the sudden departure of someone, when it Reverses there may be the sudden arrival of someone, especially from overseas. They may turn up out of the blue causing a great surprise to all. Prepare for setbacks in plans for travel when the Two of Wands appears reversed in a travel related reading. In relationships, you may choosing to stay in a unfulfilling one as you are unable to find the strength to leave. You believe things could be worse so it is best to stay where you are. If there is a choice to be made between two partners, then you will probably choose the safest and most reliable one. You may have a keen sense of adventure and desire to travel or emigrate but your partner prefers the safety and security of home and what is familiar. They see nothing wrong in their world and certainly have no intention of throwing it all way for the sake of a bit of excitement and distraction. This can cause a divide with one partner having to sacrifice their dreams for the other. On the other hand you may have a partner who is constantly restless and never happy with what they have. The grass is always greener on the other side. If separated, The Reversed Two of Wands can indicate the sudden return of an ex-partner or reconciliation. Career wise, The Reversed Two of Wands may find you choosing to stay in a unfulfilling career or position due to fear of change and lack of security. You may sacrifice your dreams, ambitions and job satisfaction for the mundane and secure. A partnership you got involved in may not be working out or you took the safe route and chose not to engage. You may not have wanted to share control over your business. Your business may have decided not to expand into the overseas market or have regretted doing so. The idea and reality of the original Ace of Wands may not have been received well abroad. You may need to go back to the Upright Ace and examine it closely as you may be missing something. Have you run with a course of action that was not yet complete or well-formed. Did you launch too early or at the wrong time. You may have moved too hastily. Remember prior preparation prevents poor performance. If you were thinking of emigrating in search employment or better career prospects, then the decision may have been too much for you to make. You may have decided to stay where you are and settle for less. On the other hand, lack of success in securing employment could find you heading back to The Upright Ace to explore the possibility of setting up your own business. Possible deception accompanies the Two of Wands Reversed. Look closely at your situation and those around you for everything may not be what it seems. *When we next meet the Wands in Card (III) it will be interesting to see what decision they arrive at and what action they take as a result. you wrote Ace of Wands instead of Two of wands, typo? Thank you for your feedback. Yes, I did mean to use the Ace of Wands as it gives background to the Two. However, I am not sure if you are aware that I am updating all the cards and am well over 3/4 through. I will be expanding on The Two of Wands and it will be a lot clearer then as to why The Ace of Wands is so relevant. In fact the Ace is quite relevant throughout the entire journey of The Suits as this it is the original potential and the spark that moved them into taking their first step forward. They must carry their Ace throughout their journey as it is a reminder of who they are and all they can do. The Ace is the pure aspect of their Elemental Energies. After receiving your comment I had a quick run through the Two of Wands and have written some additional information which should make it much clearer to the reader. I will be going back and writing on it in more depth later. At present I am working on The Four Knights. Again, thank you for taking your time to write and let me know. I have a feeling I replied to this before but I still find it sitting in my pending folder. It must be remembered that Timing and The Tarot is never exact and should not be relied on for accuracy. 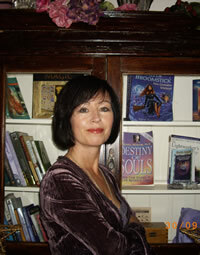 There are different systems in Tarot and therefore allocation of time etc varies from one system to another. I can give you my version but you will find there are several more available. That is why it should not be taken too seriously when seeking an exact timing. It is best to approach it as a more generic time frame for events. Many Layouts or SpreadS will have designated positions which refer to time spans. Most however will only run up to 18 months/2 years ahead of the reading. The Past Position generally refers to 2 years previously but can go right back to childhood depending on the reading and the card involved. The Numbers on the Cards can represent hours, Days, Weeks, months or years. It is up to you to set the parameters for which one they are to represent before you start the Reading. Ace could represent 1 hour, 1 day, 1 week, 1 month, 1 year etc. Therefore The Ace of Wands could represent the first hour, day, week or month of Spring. Kings indicate that the issue or event happened this time last year. It can also be viewed from the Suit the King belongs to. Therefore, if it is The King of Pentacles then the event may have occurred in the winter of last year and so on. The Queens indicate that the situation or event was dealt with in the previous season, so if you are doing the Reading in Summer, the issue occurred in Spring. Major Arcana Cards can either be linked to their Astrological Associations therefore giving a time span, or they can suggest that the situation or event will not occur or come into being until the Lesson of The Major Card has been assimilated or implemented. I hope that has helped you with understanding timing a bit better. 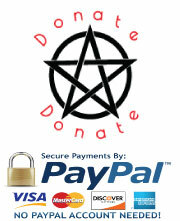 However, please remember that nothing is ever carved in stone or absolute in Tarot or any other form of divination. I have just checked for this typo and found the sentence alright but cannot find where the typo is. It reads ‘he may be thinking about travelling far away from home, and possibly all he knows.’ Is it somewhere else that I am missing? Sorry for the delay in getting this sorted but I am now on a full-time course and time has become very restricted. I’m sorry. It’s my mistake. Anyway, I would like to ask you if there’re any good tarot books that you’d recommend to me? Nice to know that you’re on a full-time course and possibly pursuing something you’re interested in. Thanks in advance. I so appreciate this resource. I use it almost daily, as I find I can get the “energy” of the card when I read for another person, but never for myself – a distinct disadvantage when it comes to pulling a daily card! Thank you for creating it. A while back someone gave me a box of Tarot cards that came with a little booklet and a layout sheet; I have read through the booklet, but am dissatisfied with the supposed “instructions,” but now feel hopeful after finding your site! I have seen the reference to the cards being “reversed,” how does that happen? Whenever I have run across one that is upside down, I have made the assumption that I had inadvertently flipped it when attempting to shuffle and have righted it. There were no “clear” instructions included as to how to deal, shuffle, or anything else. Thank you for the assistance!! In the second case, cards can just fall reversed if we are not bothered as to how we return them to the deck on completion of a reading. They can be placed reversed in the deck by simple error. Many readers ignore a reversed card in this manner and choose to read the upright version of all cards.